Curio: for museum storytellers to make your own interactive object labels. There's nothing quite like the experience of hearing a passionate expert, or someone with a direct connection, tell you about a fascinating object in their own words. Curio is a software platform that allows you to give every visitor that experience, by making your own rich interactive stories and publishing them to touchscreens for others to engage with. Simply take an image of the object, highlight the most interesting parts and add a story to each highlight. 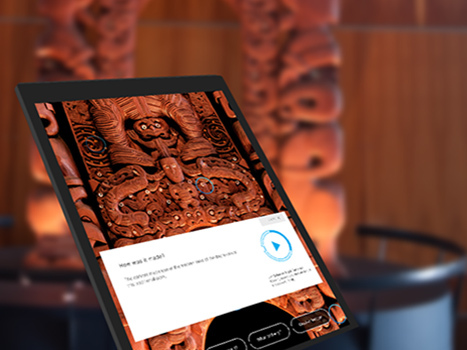 Publish your interactive to a touchscreen, ready for visitors to interact. Once it is live, you’ll have access to analytics to see how visitors are using it. Make your own engaging digital interactives - in less time, for less cost. Capture stories from your experts, and share them with your visitors. It's easy, affordable, and even fun. No technical skills are needed. Make an interactive from your desktop, and publish it into an exhibition.